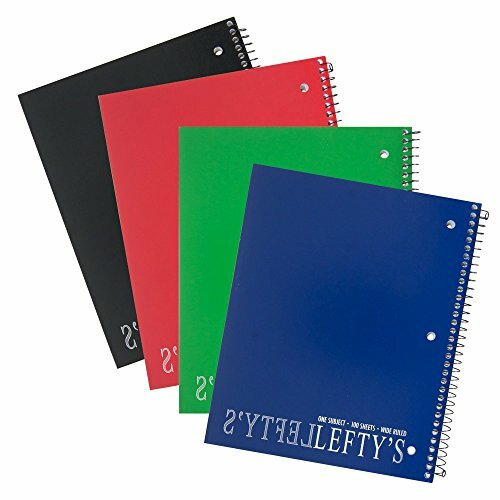 Set of Four notebooks with wide-ruled pages which are especially designed to help young lefties learn to form letters. One subject, 8" x 10.5",100 sheets, opens left to right with the spiral on right side for left-handed writing convenience, holes punched on left side, perforated for easy tear sheets. Proudly announces that this notebook is the property of a lefty in regular type and also in mirrored image. Photo shows the color assortment. We will pick for you from what's available in stock. Set of four notebooks which open from left to right with the spiral out of the way. Color assortment will vary from what is pictured. If you have any questions about this product by Comet School Supply, contact us by completing and submitting the form below. If you are looking for a specif part number, please include it with your message.